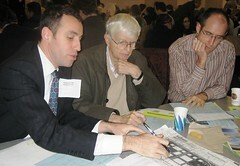 Dan moderates a discussion table at the community forum about the West Side Rail Yards. 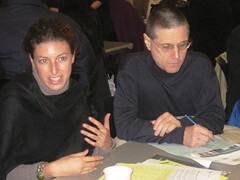 Danielle listens to community members' concerns about the five proposals for the Rail Yards. 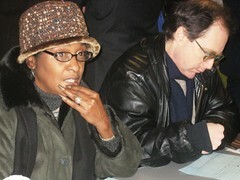 Many community residents focused their comments on the need for more affordable housing. 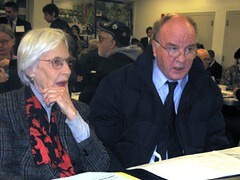 Paul listens intently to the discussion at his table. 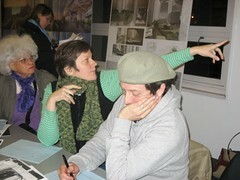 West Siders consider the various proposals. 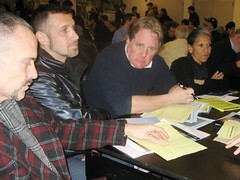 Peter from Friends of the High Line talks with representatives from SEIU and the Hotel Trades Council. 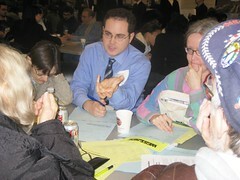 Sharon challenges her table-mates to think critically about the affordable housing plans. 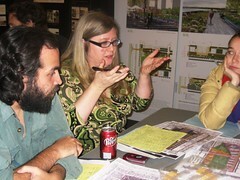 Vivian expresses concerns about the overwhelming density of development proposed for the Rail Yards. 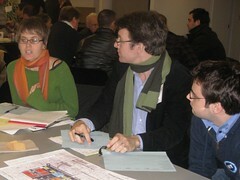 Community Board members Lee, Sarah and J.D. walk through the plans. 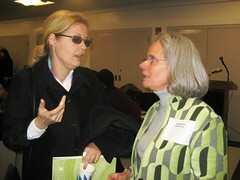 Meta and Anna at the Rail Yards forum. 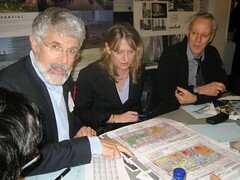 Paul, Dahlia, Gene and Marisa demanded that the development include affordable housing for a variety of income levels. 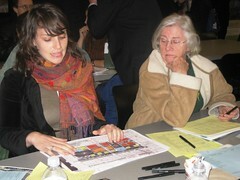 Danya and Yvonne review color-coded details of the different proposals. Joe helps illustrate the discussion at Jenny's table. CB4 chair J.D. 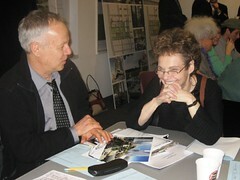 Noland chats with Hudson Yards Development Corporation president Ann Weisbrod. 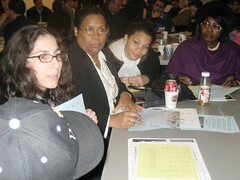 At Meredith's table, SEIU members talked about the need for service jobs on-site to pay a living wage. 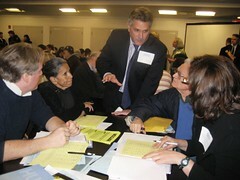 Anthony, stuck with black and white copies, walks CB4 member Ed Kirkland through the proposals. 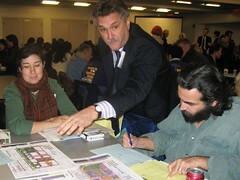 Camilla points to a posterboard visual of the Extell plan as Gloria looks on. 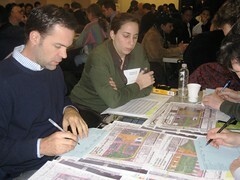 Melanie helps review plans with neighborhood residents.